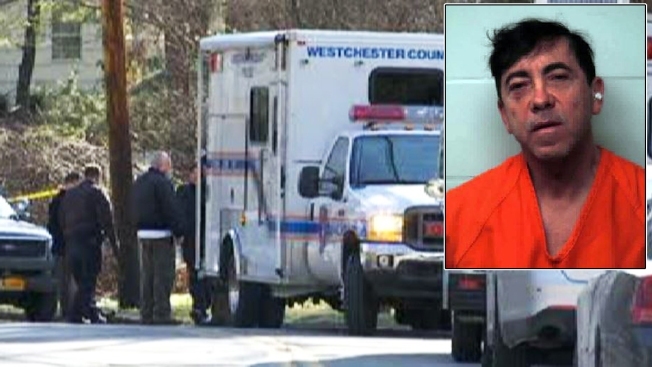 A financial executive pleaded not guilty Tuesday to charges he killed his pediatrician wife by stabbing her 22 times while she was taking a shower at their multimillion-dollar Westchester home. Julius Reich, a 62-year-old partner in a financial services company, was arraigned on a second-degree murder indictment in the Jan. 20 slaying of his wife, Dr. Robin Goldman, in their Scarsdale home. "In what can only be described as an ambush," Goldman was stabbed 22 times with an 8-inch kitchen knife, said Acting District Attorney James A. McCarty. Police got a 911 call of a woman seriously injured at the five-bedroom, four-bathroom property, which sits on 1.29 acres. Goldman suffered a punctured lung, heart, diaphragm, liver and kidney. The two were divorcing but still lived together. In court Tuesday, Reich signed orders of protection barring him from contacting the couple's three grown children, the prosecutor's office said. Goldman, 58, was affiliated with the Children's Hospital at Montefiore Medical Center in the Bronx and was a faculty member at Albert Einstein College of Medicine. "Family, community and religion were the pillars you instilled in us," daughter Alyssa said in her eulogy. Reich's attorney, John Pappalardo, called Goldman's death "a tragedy for everybody involved." It was the first homicide in Scarsdale in nearly four decades. The last killing was in 1977, when Yale University senior Bonnie Garland was bludgeoned to death in her home. Her ex-boyfriend, Yale graduate Richard Herrin, was convicted of manslaughter. Reich's next court appearance will be April 5.